It seems the less said about the subject the better it is for both parties. The members and grassroots of both parties are feeling the heat and thus mosts of them are giving their so called”objections‘ to a merged entity. We have covered this subject quite extensively and in the last couple of days internet portal ,”Malaysiakini” and another PRS SC members blog,”Borneo Warrior” also gave the political netcitizens something to ponder on this subject. Obviously, the spark has started the fire and it is starting to engulf both PRS/SPDP top hierarchy. In conversations up and down the State of Sarawak it seems that most people are pointing the finger to the deputy of SPDP Peter Nyarok Ak.Entri who is very much against the “idea of a merged entity” Is Nyarok so powerful?One could even hear the echos coming all the way as he is the voice of a certain higher ranking and powerful SPDP tycoon. A political strategists said In Iban” IYA ENDA BERANI“( Not brave enough). We also received an Sms which hit the nail in the coffin as we blog this article ,”MP Tiong put up a strong resistance.” What more is there to say.? Does anyone dare to go against him? The PRS boys dare to go against Sng Chee Hua but with Tiong are there anytakers? This remains the stumbling block but with Mawan helming the merged entity maybe this might just make Tiong give way? Any bets that there will surely be other resistance..??? We say as always,”There is a song called” NO MATTER WHAT” and the political figures involved in this merged entity will be HELL BENT TO PUSH THROUGH THIS AGENDA.BELIEVE ME…. Are you ready for this..? It seems embattled PRS President James Masing has somewhat found a way to divert his already fluid relationship with the CM Taib by tabling a motion at last weeks Supreme Council meeting for a Merger. It was agreed but with a condition that SPDP first table a resolution for a CALL OF A MERGER. PRS will then only hold its TDC in which they will follow suit.All this will be done in the early part of next year 2010. The blue print and the much needed nod of approval from one set of Supreme Council seems to have unlocked the key for a Merger of both parties. Though negotiations are ongoing it seems that mosts details have been ironed out and at bests all political appoitments will be ‘status quo“. James once a Blue Eyed Boy of CM Taib has somewhat now found himself at the wrong end of the CM’s stick and he has suffered more Black Eyes than what his supporters are used to. He was once revered as an upcoming Dayak leader and his advises and assistance were generally sought for. The GOLD LADEN CARRIAGE RIDE has somewhat stopped. Over the past year he has been seen to be making too many mistakes where it was almost impossible for CM to cover his endless journey of political mishaps. His supporters thought getting rid of “Larry Sng” was the answer to all their problems but it was all James wrong undoing/manouvering which has caught up with him in a quagmire. As a politician James somewhat forgot a very SIMPLE POLITICAL RULE. It’s to cover his tracks properly eventhough as a trained Antropologists he thought that he could deceive or outwit those who he has somewhat forgotten says a political watcher. There were many instances which he thought he could plaster over with “A genuine statement in supporting BN” but CM has already done his homework and kept the minute details in his locker room far from his very OWN eagled eyed and eves dropping machais. James Masing’s impending tussle with Entulu might not happen as the bigger picture it seems is now the Merger entity. Entulu must thank his “Lucky Stars’ that the Hidden Hands/Puppet Masters have worked a better deal for him to carry on his political journey. SPDP President Mawan would be watching this political scenario with Interests as he gets on with his usual Adminstrative work for the State Government. His advisors would have advised him to play to the tune of CM Taib and do not even try to push any buttons which might trigger a FALSE ALARM. 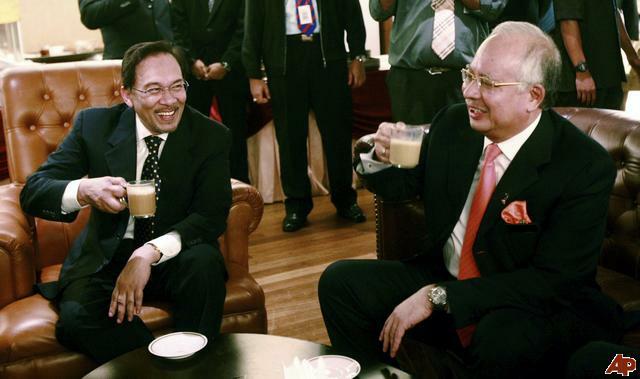 Obviously, the answer is that BN4 would soon be BN3 to face the “UNITED” opposition in the next state elections. We say as always,”There is tension on the ground especially with the impending SPDP/PRS merger talks eventhough many are denying it. We shall just leave it to the HIDDEN HANDS to work their Magic..